Author's Note: I am very excited that the community group I play in, the Philharmonic Society of Arlington, occasionally showcases works from local composers. We even have a few composers on staff. 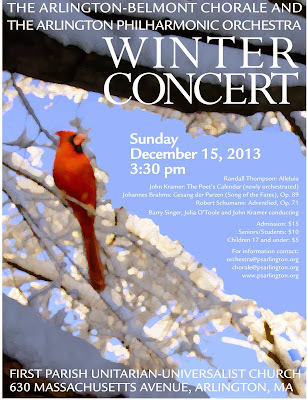 This holiday season we are playing a delightful work by one of them, John Kramer. Pianist and composer John Kramer is Music Director at the Winchester Unitarian Society and the Chamber Chorus accompanist for the Philharmonic Society of Arlington. He will conduct a performance of his award-winning composition, The Poet's Calendar, newly orchestrated, with the Arlington-Belmont Chorale and Arlington Philharmonic Orchestra, on December 15, 2013. APO violinist and violinist.com blogger Karen Allendoerfer interviewed John about the piece on November 25. Karen: You mentioned at the first rehearsal that you originally wrote this piece for a contest. Can you tell us more about that? John: I'm always casting about for new ideas to write about. There is an organization in Portland ME called the Longfellow Chorus, and in 2010 they had a contest for new settings of Longfellow poems. I got the email about the contest, and I sat down with this big book of Longfellow poems. It was about 1000 pages long and at first I thought I wouldn't find something. But after about 10 minutes, this poem ('The Poet's Calendar,' see below) immediately hit me. It was like each month was made into its own little character. Maybe it spoke to me because, as a fellow New Englander, I experience these different kinds of weather so often. I also liked the use of Roman and Greek imagery and references to the Gods. Karen: So you didn't know this poem before the contest? John: No, not at all. I do read a fair bit of poetry looking for things to set to music, but you can't be familiar with every poem in literature. So this contest was a useful foil for finding a poem. Once I read it, the sounds just came to my ear. January has the driving winds, and February has a bleak, desolate landscape, with a cleansing lustration. John: That's the word in the poem, lustration, meaning a ritual purification of the soul. There is a line that reads, "By me all things unclean are purified." When the cold air hits you, you feel a little bit like you are being cleansed. For June I went with the marriage idea by using a little Renaissance antiphonal thing between the chorus and the brass section. Karen: You say that each month has its own character. As a string player playing the piece, I notice that you have chosen some unusual keys with a lot of sharps or a lot of flats in them. Even in this age of equal temperament, do you still see the different keys as having unique characters too? John: Yes, definitely. I think they still sound quite different from each other. For example, July is in G# minor, which gives the strings a darker character because there are no open strings. The piece is also played low in the strings, on the C and the G strings. This gives it a different sound, more exotic than A minor would be. We just don't hear G# as often as A minor. Whereas for November I wanted a kind of garish sound, with the open strings. Imagine the string songs of the Hurdy-Gurdy. It has these open 5ths and a very lonely sound. Karen: Is there a logical progression of keys throughout the piece? John: No, I was not thinking structurally so much. As I was saying, some movements suggested particular sounds. Sometimes I was looking for a contrast, and sometimes looking for a link. February ends in B minor, and March begins in C, so those two movements are directly linked. And January starts in F-minor, while December ends in F-major, so you have a bit of closure there. It's not the same sort of arrival that you'd expect in a big symphony, though, where you return to the opening key. The relationship of F-minor in January to B-minor in February is a tritonal relation, which sounds very strange to us. It amplifies the element of lustration in February. Karen: Can you describe your writing process? John: I compose all different ways. I write a lot at the piano. I will sketch on pencil and paper at the piano, then go to the computer, which I use mostly like a typewriter for music. Then I go back to the piano. I might make a few sketches on the train, but in my home studio, the piano and computer are very close together. The computer is just a tool. Some of the instrument playback technology is a little bit seductive. It's getting better and better, but it's not anything like what real players will bring, so you have to be careful about trusting that. I still mostly listen to what's in my head. But the technology for typesetting and production of parts is very much appreciated. Karen: What is it like to hear your own piece performed by others, and to conduct your own piece? John: For the contest, I ended up as a semi-finalist, which meant that the piece was first performed with chorus and piano, even though I'd imagined it for orchestra. The piece was also performed as part of a service of the Winchester UU society in a smaller arrangement with piano, violin, and cello, and I conducted that performance. I'm really glad to have this chance to have the piece performed with orchestra this time around, since I first heard it with the whole orchestra in mind. And I'm very pleased with how it is coming through. There are some things with balance and blend that I will come back to and continue to work on in rehearsal, but in general, what I am hearing is what I intended. I haven't been caught off-guard. I tend to feel that there is a broad range of what is "right" in music. If you listen to 5 recordings of a Beethoven violin sonata, they're all right and all different. When I hear someone else play my music, they may bring out details that I didn't think were as important. Karen: What is your primary instrument, and what kind of training did you get to become a composer? John: I have an MFA in piano performance from the University of Iowa, and a BA in composition. Now I am pianist and music director at the UU Church of Winchester. I have also done musical theater shows. I've sung in choruses all throughout high school and college, and I played the violin. I'm more familiar with the strings, but I learned about winds through writing for them. Now I learn by listening to the players themselves. Sometimes I listen to them complain about parts that are written badly for the instrument, but generally I want the performers to have a good experience. Of course you write for the audience, but I also want the players to enjoy playing it. Invariably there is a spot where the composer wants a certain sound, and that's what he writes. A famous example is the opening of Rite of Spring. Stravinsky asked the bassoonist to play in a register that was much higher than usual for bassoons of the time. Now it's an accepted part of the repertoire and everyone plays that high. Karen: What kind of music do you like to listen to? You mentioned Stravinsky. Who are your favorite composers? John: I enjoy a wide range of music, from the Renaissance through new works, and I also work as a jazz performer and composer. I am inspired by Bach, although tonally I am looking for a different sound than Bach. Sometimes I am closer to Messien or Bartok. The Poet's Calendar is not as modernist a piece as that. It's more of a pastiche, borrowing from different traditions. I mentioned June sounding like a Renaissance piece, and December is in the baroque style, like going to a Handel's Messiah sing. I wanted to invoke that feeling and have fun. July is harmonically rich, more towards the modernist end of the harmonic vocabulary. There you hear jazz voicings with minor 7th chords with a 9th in there. French composers of the early 20th century used those jazz harmonies. Karen: As a player, I think it's nice that The Poet's Calendar is accessible to an amateur group like ours, or to a church group. There are all those different keys and sharps and flats, but overall it's a piece that we can play. You don't always see that with contemporary music. Some players are intimidated by it. John: There's actually very little contemporary music that's appropriately written to be performed by groups like the Arlington Philharmonic. It's true that in modern music if new techniques have been developed, composers are encouraged to use them. If you are in grad school in composition, it's assumed that you will be writing for top-notch professionals, and you will be challenged to write something very difficult. Some programs become bastions of "New Music," that doesn't end up being broadly appreciated. But that's not the case here. I'd like to thank Barry for programming this and the orchestra and chorus for enthusiastically performing it. Without players, it's just dots on a page! The Hunter's Moon reigns empress of the night. O'er orchards and o'er vineyards I preside. Proclaiming "Peace on earth, good will to men." Karen - thanks so much for posting the interview. My orch also likes to present music by new composers from time to time, and it is always interesting to find out who the good new local composers are and what they do.